Stop spending precious calories on toppings and spreads made with trans fats! Opt instead for nut-butter-derived options that are delicious and good for you! When you're looking for a delicious dressing or simple spread to accompany your favorite meal, it’s common to resort to a high-fat, calorie-loaded condiment. Is choosing a fatty favorite as your proverbial icing on the cake a healthy decision? It's highly dependent on the type of fat you choose. Some options are loaded in saturated and trans fats, while others are bursting with unsaturated, "healthy" fats. Fortunately, these three toppings are made with good-for-you fats from some of your favorite nut and seed butters. So, grab a jar of your favorite, and start enjoying it in more ways than with jelly or a spoon! Adorned with a curry-infused creamy sauce, this recipe will help you actually crave vegetables. The same sauce can also work on chicken or fish. This fanciful dressing is sure to breathe new life into your salads. It can be kept chilled for up to 10 days and should be enough dressing for four salads. The same recipe also works well with other nut butters like cashew, walnut, or almond, and serves as a nice pairing with steamed veggies. 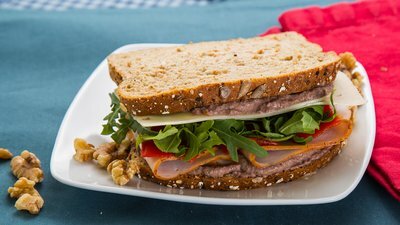 If you’re bored with your normal turkey and cheese sandwich as a midday meal, try slathering this flavorful, fiber-packed spread between a couple slices of whole-grain bread. Finish the sandwich by topping with roasted red pepper and a handful of arugula. You can also use it as a cracker spread or a dip.